OK – a lot of you who didn’t make it to the Board of Selectmen’s meeting on Monday – or who did make it but had to leave early (I’m looking at you, Claus!) – have asked me to provide a run down of what happened. That’s what I’ll do in this blog post, with the proviso that its not too late to express your desires and preferences regarding the Bike Path to both the Selectmen and Town Planner, as well as the members of the Community Path Implementation Advisory Committee (CPIAC). Once again, just send an email to our Selectmen (selectmen@belmont-ma.gov) and copy the members of the Community Path Implementation Advisory Committee (CPIAC) at path@bloggingbelmont.com. Also, copy Town Planner Jeffrey Wheeler (jwheeler@belmont-ma.gov) on your message. First, there was huge turnout, prompting the BOS to hold their meeting in the Town Hall auditorium. True, Community Path wasn’t the only issue on the agenda, but given the exodus after we finished discussing it, I’m guessing 1/2 to 2/3rds of attendees were there to talk about the Path. Both path supporters and opponents were there in good numbers, but I’d say the supporters solidly outnumbered opponents. So if you read about the meeting here and turned out Monday: thank you!! Setting the tone of the conversation – before the conversation of the Path even started- there was the letter from the Massachusetts Department of Transportation (Mass DOT), which I’ve attached here. I took the liberty of bolding the sections that should absolutely freak you out. 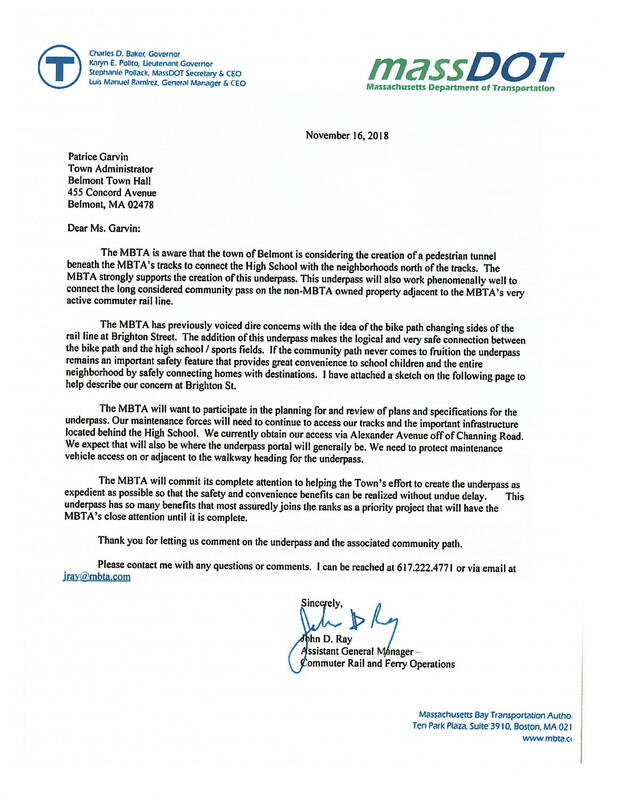 Basically what Mr. Ray is saying is that the MBTA does not approve of an at-grade crossing but does really like the idea of an underpass connecting the Winn Brook neighborhood to the High School campus. If need be, the MBTA is ready to go ahead with one but not the other. For all those (including CPIAC member Mike Cicalese who has argued that Belmont has the State over a barrel with its desire to build this 2 mile segment of the Massachusetts Central Rail Trail), the MassDOT letter should be a wake up call: MassDOT is ready to send Belmont packing on the Path if the town insists on an unsafe route when an alternative, safer route (the North side of the Fitchburg line tracks) stands at the ready. We’ve been warned. And with the State and Federal Govt. expected to pick up 90% of the cost of this project, that’s a loud warning. 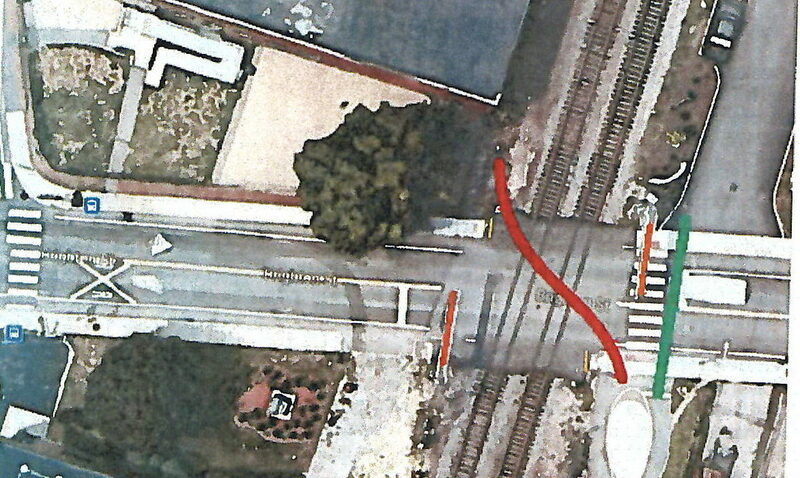 A graphic showing the proposed north-south switch at Brighton Street in Belmont, which the MBTA calls unsafe. Image courtesy of the MBTA. The Selectmen first expressed their desire to hear from all sides on this, and to counter the whisper narrative that the BOS was acting imperially again, as it did with the Town Green a couple years back. Having spearheaded opposition to the Town Green, I concur with the BOS that the two situations are nothing alike. BOS invited CPIAC Chair Russ Leino up to discuss that Committee’s vote in October, which split 3-2 in favor of sticking with the recommended route on the south side of the tracks and pushing back on the MBTA and MassDOT. Russ talked about the discussion leading up to that vote. The word “contentious” was used a lot. Long and short: a slim majority of CPIAC members felt like the south side of the tracks was so advantageous to the town as to override the safety concerns of the MBTA. Why is one side of the tracks so superior to an equally viable side of the tracks just 15 feet to the north? It depends on who you ask. CPIAC member Brian Burke took the first shot at explaining why. His story was a long and colorful sales pitch and was presented with a lot of hand waving. He spoke of as yet undeclared, unplanned and unfunded improvements in Cambridge to support residential developments off of Concord Ave and in the Fresh Pond area. Tapping into this development would be like discovering gold deposits under Belmont High: a huge boon to the Town that we couldn’t afford to walk away from. There are a bunch of problems with this narrative. First: none of the developments and improvements Burke is speaking of are even on the drawing board in Cambridge, let alone funded by that City and ready to go. Third: all this land is in Cambridge, not Belmont. That kind of ties Belmont’s hands, even if we really wanted the south side trail to happen, which its not clear we do. Plenty of path supporters got up to speak and make the same arguments we’ve heard for going on 10 years now: the need for safe passage for bikers and pedestrians through Belmont, the environmental benefits of taking cars off the road, the economic benefit to Belmont to connect our business centers to growing residential developments on Cambridge Park Drive and in Fresh Pond. In the end, the BOS suggested they would take the comments under advisement and also follow up with MassDOT and the MBTA to allow them to clarify their (op)position to the proposed South Side route. But reading between the lines of the MassDOT’s last letter to the town, it seems increasingly likely that the choice for the Community Path will be a “North side or bust” decision. As Selectmen Dash suggested: like it or not, Belmont could soon have to decide between a path on the North side of the tracks and no track at all. Here’s hoping the Selectmen make the right decision, should that come to pass.